Taking the high spot on the day at 26,000gns was the classy March 2017 born maiden heifer Grahams Nikita from Robert and Jean Graham, Bridge of Allan, Stirling. By the Wilodge Vantastic sired Claragh Franco and out of Grahams Coffee, Nikita is full sister to 40,000gns Grahams Lorenzo, 32,000gns Grahams Lilly, 38,000gns Grahams Natalie, 20,000 Grahams Nashville and 16,500gns Grahams Lizzie. 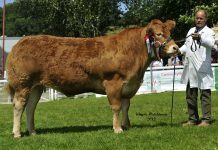 The super stylish and correct heifer was knocked down to R & A White and Son, Two Thorns Fields, Hope Valley for their Ladybowers herd. 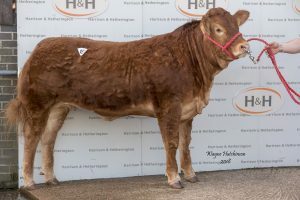 Nikita has been entered into the Royal Highland, Royal Welsh and Great Yorkshire Shows where she will be shown by the Grahams team before making her way to her new home. 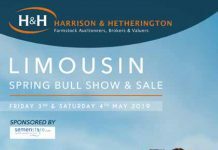 Speaking after the sale, a delighted Robert Graham said “I am very happy with the outcome of today’s sale; Nikita is a fabulous, correct heifer with super breeding behind her. She will without doubt be a great addition to her new owners herd”. 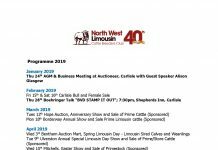 The Graham family, which runs well-known dairy processing business Graham’s The Family Dairy, also achieved 5,500gns when they sold the rising 20-month-old heifer Grahams Marigold. By Kilcor Iceman, and out of Grahams Eureka, she sold to an undisclosed buyer. 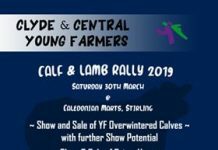 The Foxhillfarm stable of Mike and Melanie Alford, Cullompton, Devon brought a super cohort of Trueman Jagger daughters to Carlisle and took the run of the leading prices following Grahams Nikita. 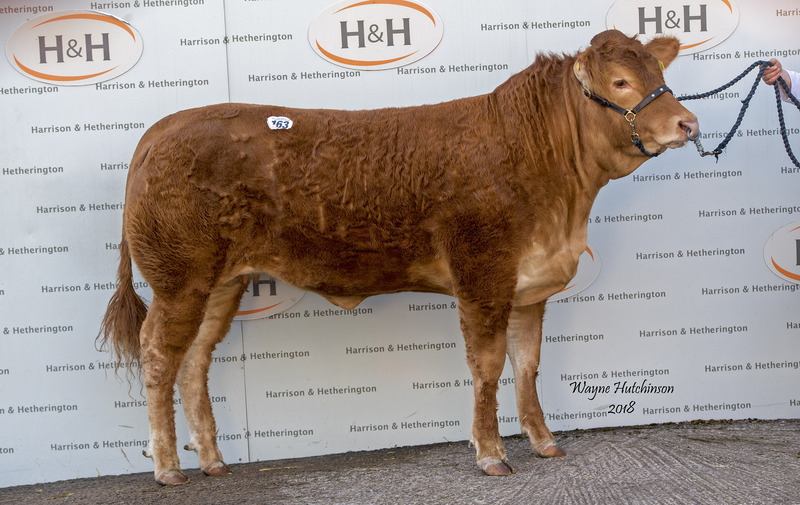 Leading their trade, and taking the second highest price on the day at 9000gns, was Foxhillfarm Natalie. May 2017 born Natalie is out of Foxhillfarm Isla who was a member of the Interbreed Group successful at the Royal Highland Show in 2015. 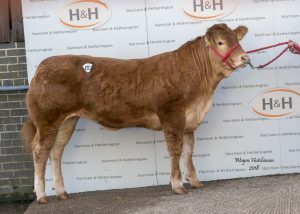 Natalie is full sister to Foxhillfarm Naomi, Reserve Junior Female Champion at last year’s Stars of the Future fixture. 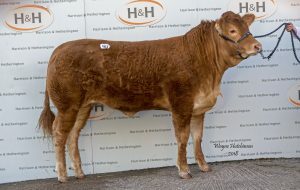 Taking her home, with 12 other purchases for his Dutch Limousin Company, Cowporation BV, was Mr Teus Decker. 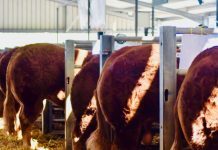 At 8,000gns came Foxhillfarm Nancy, a January 2017 born heifer out of Bankdale Elizabeth, a cow with a fantastic breeding reputation. Nancy is full sister to Foxhillfarm Madonna, Senior Heifer Champion and Reserve Senior Overall Champion at Stars of the Future last year and a member of the Foxillfarm show team for 2018. She was knocked down to M & JC Gould, Grange Farm, Shrewsbury. Another Isla daughter, Foxhillfarm Nicola made the same money. The May 2017 heifer is full sister to Foxhillfarm Naomi, Reserve Junior Female Champion at Stars of the Future at just seven months of age last year and also destined for the 2018 show team. She was another purchase for Mr Decker. Making 7,000gns was the Bankdale Alice daughter Foxhillfarm Nextmillion. The rising 12-month old was knocked down to Helen Wilson, Bankdale Farm, Carlisle. 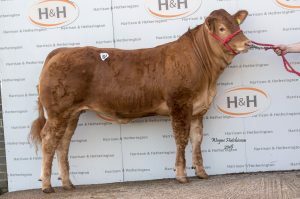 Selling at the same price was the next lot in the ring, this time in the shape of Foxhillfarm Nellie. 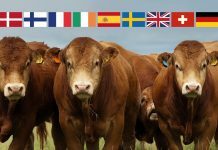 The May 2017 born heifer, the same way bred as 9000gns Foxhillfarm Natalie, is another heading to The Netherlands with Mr Decker. Foxhillfarm Nannymcphee, also born May 2017 and bred the same way as Natalie and Nellie realised 5500gns in selling to Mr Decker. 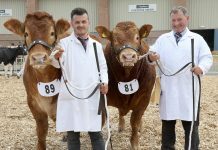 Mr Decker added to his cohort of cattle with Foxhillfarm Noleen and Narnia at 4500gns each, both May 2017 born, but out of Isla and Bankdale Alice respectively. 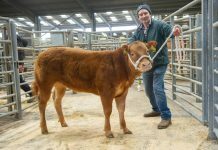 He also purchased the stylish August 2016 born Netherhall Jackpot daughter Ampertaine Milda from WJ & J McKay, Maghera, Co Derry for 4,000gns. Out of Ampertain Bethel, Milda goes back to Kype Interrogate who has bred many successful show calves. 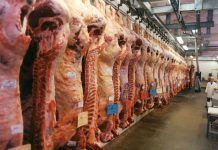 He paid the same price for the 12-month old Goldies Fandango daughter Tweedale Nancy from Jonathan Watson, Berwick upon Tweed, Northumberland.